Watching a concrete shelter being blown up is an interesting if slightly bizarre experience. We are not talking about another attempt to dynamite the indestructible remains of Hitler’s Atlantic Wall. In contrast, the Concrete Canvas Shelter (CCS) is blown up gently like a kids’ bouncy castle. Resembling a sort of vast, fossilised slug, the 50 square metre shelter could last 50 years, but takes only a few of hours to erect. It seems so obvious that one asks why it took until now to put together the technology making it possible. 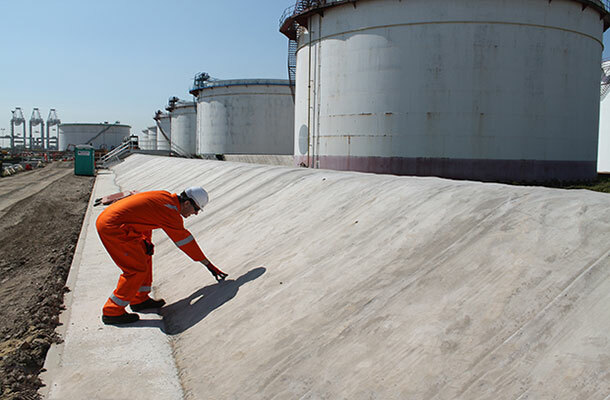 This is a thick textile, impregnated with a dry cement mix or, to use its technical name, a geosynthetic cementitious composite mat. 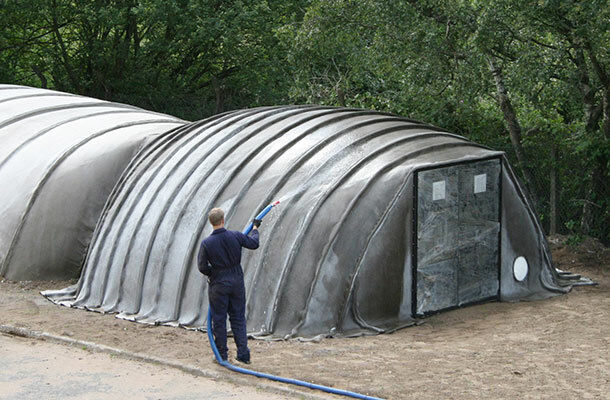 Peter Brewin and Will Crawford, who run the Pontypridd company now turning out the shelters and the Concrete Canvas® GCCM (CC) material, came up with the idea when challenged to develop a new use for cement. Postgraduate students on an engineering design course run by the Royal College of Art (RCA) and Imperial College in London, they were given the backwards brief and ended up exploring an entirely new technology. Elements of their idea were already around. Surgeons have long used plaster-impregnated cloth for casts to reset broken bones. There are inflatable shelters, tennis courts and the like. Architects have covered some of them in situ to create concrete domes. That’s laborious, costly and difficult to repeat a hundred times over after a devastating earthquake. Brewin and Crawford attacked the problem the other way round: they put the cement into the material they inflated. All that was then needed was some water to spray over it. The reason our product exists was our time on the RCA-Imperial postgraduate course. It gave us the freedom to work on our own idea. It is a key moment in peoples’ lives. Can they find the opportunity to develop a new idea rather than go after the first good job offer? Can they do that before personal and family commitments get in the way? For a university incubating spin-out enterprises, there is a reputational and funding kickback that creates a virtuous circle. For the postgraduate, it is a low-risk time to do a start-up. At CC, you can see how the backwards brief became a way of working for the new enterprise. The shelter idea that led to CC remains good, but as a commercial venture, it is rather the opposite. It is true that we did the textile to create the shelter, but the shelters take considerable space and work to produce. They are not an easy product for an SME. And the NGO and disasters sector is a challenging one: you cannot predict demand. You cannot get a production line running with any regularity. In addition, NGOs generally want you to be financed directly by their donors. You end up plugged into politics rather than business. The first funding to enable the shelters to be produced meant they had a factory in Pontypridd turning out the textile, but a business that could not survive by shelters alone. At the RCA, they had to think of new uses for cement. Now, they had to think of new uses for their textile. The YouTube video of the shelter going up has over 8 million viewings. However, the important thing they had patented turned out not to be the shelter, but the new material making it possible, Concrete Canvas® GCCM. Brewin had been a Royal Engineer and their first order was to use their material to cover and strengthen sandbag defences round British bases in Afghanistan. The big breakthrough was civilian: using it for ditch-lining. The properties that enabled the material to be blown up and then fixed firmly enough to let you stand atop their structure, mean it was equally good at permanently, cheaply and quickly lining with a waterproof, hard-to-damage surface almost any hole, trench, tunnel or slope cut in the ground. Turning out straightforward rolls of the special matting also makes for a much better business model for a start-up SME. No surprise that the shelters are now only a small part of the business, perhaps as little as 1%. The RCA put funds into filing their first patent that protected the preliminary stages of building their business.